After a cruisy two-hour drive from San Francisco—with a compulsory stop at In-n-Out of course—we arrive in Sonoma and check in at Fairmont Mission Inn. The sprawling property is made up of low-rise Spanish mission-style buildings which, shrouded by greenery, make for a classic California setting. The lodge-like lobby is inviting, with large wooden beams stretched across the ceiling and a fireplace that anchors the room. The guest rooms here are luxurious and welcoming, ranging from recently restored Fairmont Heritage rooms to signature suites. What better way to shake off a long drive than with a little pampering? The spa at Fairmont Mission Inn is a short walk from the main building and offers five-star treatments ranging from massages and facials to more spiritual offerings such as reiki, chakra reading and balancing, and body-energy alignment, to name a few. Fairmont Mission Inn's Santé restaurant is the recipient of the AAA Four Diamond Award and Michelin designations, and for good reason. On a balmy night, sit poolside under the stars as you indulge in simple yet elegant cuisine that shows off the best of the region's produce, with an award-winning wine list to boot. There is no better way to see wine country than from a bird's eye view. As the sun rises over the valley and the early morning veil of mist lifts to reveal the region's terroir, you're left with an endless vista of sprawling vineyards, rolling hills and historic estates. The team at Sonoma Ballooning Adventures have decades of experience under their belt and know the region like the back of their hand. As you come back down to earth, it's time to see some of the wineries up close and Vérité Wines is a good place to start. The family-run estate was founded by Vigneron Pierre Seillan, a Bordeaux native, who remains Vérité’s first and only winemaker. He is intimately involved in every step of the winegrowing process from bud break to bottling, and has passed this passion down to his daughter, Hélène. Anchored in Pierre's droit du sol—or “right of the soil”—methodology, the winery's 40 micro-crus are hand farmed by the Seillan family for low yields of wines that display exceptional quality and character. Japanese Zen gardens in the heart of wine country—it's a thing. Osmosis Day Spa offers the only cedar enzyme bath in the country, as well as rejuvenating massages, organic facials, and beautiful meditation gardens to wander and reflect in following your treatment. It's the perfect space for a romantic couple's day out, or a great place to bond and share a relaxing experience with friends. 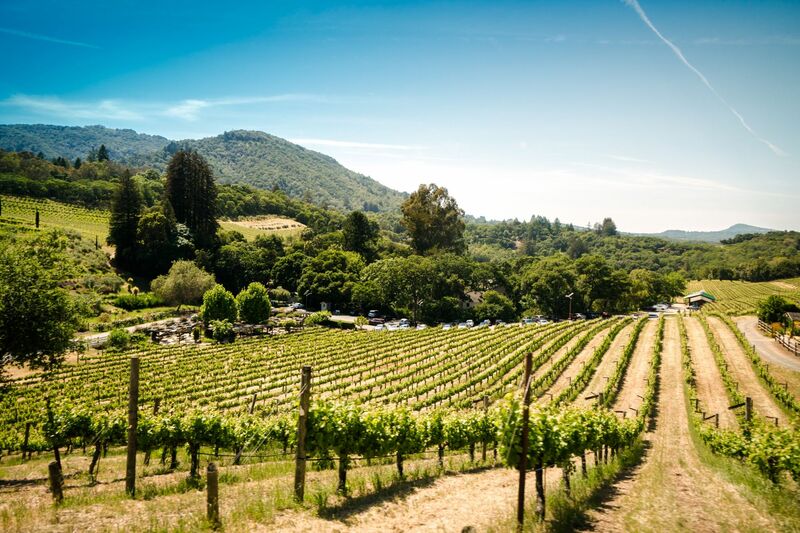 A scenic 40-minute drive from Sonoma is Healdsburg. On first impression, it's your quintessential American town, but look a little closer and you'll find that this seemingly quaint corner of the world is brimming with gems, well on its way to becoming a culinary hotspot. From The Shed, a market, café, and community gathering space that won a 2014 James Beard Award for restaurant design, to Noble Folk, an unassuming dessert shop that specialises in homemade pies and ice cream. But if there's one place that's any indication of Healdsburg's position as an up-and-comer for food lovers, it's Single Thread. Taking over the ground floor of a discreet inn that houses only five guest rooms, Single Thread has been described by Forbes as "arguably the most interesting hotel-slash-dining experience in America." The two Michelin star restaurant's well-orchestrated dining experience begins on the rooftop with flutes of prosecco as golden as the California sunset you're watching, before heading down to the 52-seat dining room. The 11-course meal is served in the style of Kaiseki, where Japanese-inspired delights made from the freshest seasonal ingredients are artfully presented on handcrafted dishware. Create a cheesy road trip playlist and hit Highway 1 for a leisurely drive along the coast. From Jenner to Bodega Bay, there are plenty of quirky pitstops as well as breathtaking lookout points. Keep an eye out for the area's wildlife, including seals and—if you're lucky—whales. Along the marina at Bodega Bay are a number of al fresco restaurants specialising in locally caught seafood, from freshly shucked oysters to East Coast-style soul food like lobster rolls and seafood chowder. A favourite amongst locals and tourists alike is Spud Point Crab Company, which makes a delicious crab sandwich you won't soon forget. The Barlow industrial-chic hub is a 12-acre outdoor market district featuring local food, wine, beer, spirits and crafts—all by Sonoma County artisans. Spend an couple of hours meandering the outlets, from the worker-run Community Market where the motto is “Food for people, not for profit” to British style cheesemaker WM Cofield. Of course, there are plenty of tastings to be had, from craft beer and wines to Spirit Works Distillery, where they use innovative techniques to produce artinsanal gin and vodka using only grains harvested in Sonoma County. Winemaker Giovanni Balistreri welcomes us with a bottle of their Rose, which we sip as he gives us a tour (and a taste) of the Russian River Vineyards' vines and on-site farm. Here, they grow everything from herbs and edible flowers to native varities of fruits and vegetables, all of which are used to prepare dishes at the estate's restaurant just a few steps away. This place is quintessential Sonoma—seasonal food and fantastic wine, lovingly produced from the land and enjoyed with a view. For the past 20 years, this cosy brasserie has been serving up classic French cuisine made with local ingredients. The Girl and the Fig is separated into two rooms - one with a beautiful antique bar and the other a shabby-chic dining area with stained wood details and Spanish yellow walls. The food, like the decor, is fuss-free and full of character. Ideal for sharing with friends, accompanied by a bottle of wine from the region. This article first appeared in hk.asiatatler.com.